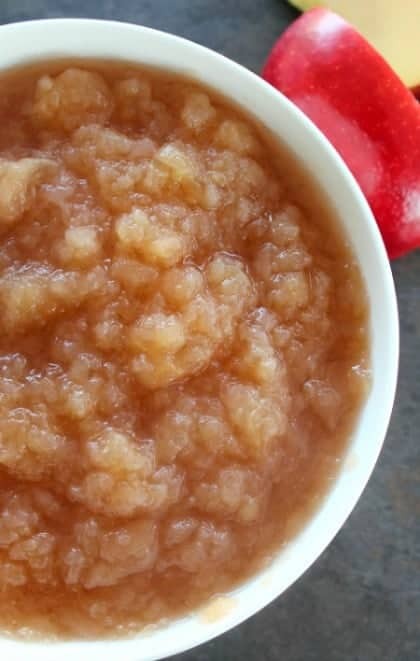 I can’t decide what’s the best part of this recipe for healthy applesauce in the slow cooker. The fresh apple taste, the fact that it’s almost too easy, or that my house smells like sweet, fresh picked apples while the dish is cooking. Well, actually the best part is the fresh yet earthy homemade flavor. And you need to make it. This applesauce is so easy, it’s almost not a recipe. And you control all the sugar (or no sugar). Make it straight, add cinnamon or make a cranberry applesauce for beautiful color and a powerful dose of antioxidants. Truly, the hardest part is peeling the apples. After peeling and rough-dicing, place them in the crock pot, then four hours later… a pot of soft, caramelized natural sweetness. Mash them up to the consistency you like. I made this batch (Jonagold apples) straight up so I could add whatever I wanted for different purposes; pour it over oatmeal or stir into some plain Greek yogurt. I added no sugar to this batch so I can add sweetness to individual portions when I want and leave it alone when I don’t. Right out of the pot, I sprinkled a little cinnamon and sugar in it to give my youngest a taste. In addition to asking for a “bigger” second helping, he said they reminded him of a certain drunken apple side dish that he always orders at one of our favorite BBQ restaurants. Well, upon hearing about this, my grown daughter demanded the recipe “Right now, Mom. Seriously”. So, here it is for my daughter. And for you. Enjoy. Cook’s note: Jonagold apples delivered the best, juiciest results for me. I made a batch with Pink Lady and they were too dry and didn’t deliver the fresh flavor like the Jonagolds. If this is your first time making them and you don’t want to experiment, get Jonagold as the apple I can confidently recommend. This applesauce is almost too easy and very delicious. The best apples to use are Jonagold, Jonathan or Macoun apples. Your finished recipe will keep in the refrigerator for up to one week or freeze for three months. Combine all ingredients in your slow cooker. Cover and cook until apples are very soft and beginning to disintegrate, 5 to 6 hours on low, or 3 hours on high. You'll know they're done when the apples darken and the juices are bubbling around them. During cooking, you can stir the apples down into the juices that are increasing a bit. I've cooked the applesauce for much longer than this many times and it just gets better and better. Mash apples with potato masher to your liking. If you want super chunky applesauce, just stir the apples until they've broken down but are still chunky. Season with additional cinnamon and sugar to taste. Also, you can add more apple juice at this time to adjust the consistency. 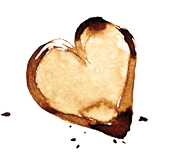 Serve warm, at room temperature or chilled. I found it was better after a night in the refrigerator. Store in airtight containers in fridge for up to 2 weeks or applesauce may be frozen for up to 3 months. A new family favorite!!! So easy and so delicious!!!! I am a HUGE fan of this applesauce! It is so delicious that it counts as a treat in my book! It was also suggested that I take my medicine with applesauce to control some of the side effects. (Well, now I have a doctor’s order!!) My daughter and I fight over this! I will buy it anytime!! I’m tempted to make it so that my house will smell heavenly! I just LOVE this stuff! This is the only applesauce my kids will eat. Great job GDM!! This is truly THE BEST applesauce I have ever had! I love the chunks of apple and the sweet to tart flavor is spot on. Can’t wait to heat some up and pour on ice cream. This is the absolute BEST apple sauce I have EVER had!!! I will be trying this. 🙂 Let me tell you, I bought an apple peeler/corer from William Sonoma and it is WONDERFUL. I’m telling you, it peels and cores an apple in one minute! Fantastic. Cost…around $30., but worth it! I use it to make an apple casserole that is a wonderful side dish! Thanks for your recipe! Hi Lori, that will be a great tool for this recipe. I hope you like it! Thanks for posting.